In his masterpiece Pale Blue Dot: A Vision of the Human Future in Space, the great Carl Sagan wrote, "It does no harm to the romance of the sunset to know a little bit about it." This ethos was echoed (although perhaps less succinctly) by physicist, lecturer, and bongo player Richard Feynman in The Pleasure of Finding Things Out. That notion was on my mind recently when my friend Steve Guttenberg posted a simple question to his personal Facebook page: "Can you describe what good sound quality sounds like to you?" My reply, I felt, was pretty succinct: tonally neutral, dynamic, and clean, with good time alignment between drivers, non-directional bass, and minimal interference from the room itself. The bulk of the replies, though, were dominated by culinary metaphors and unicorn tears. Which is totally fine, mind you. I'm all for freedom of religion. But despite the fact that no one came right out and said it, I got the sense that most of Steve's followers approach high-end audio the way that Sagan's critics approach sunsets: that to quantify is to diminish. That only the magic matters. To those listeners, I say this: if you wish to enjoy a speaker like GoldenEar Technology's new flagship Triton One in purely spooky terms, there's an awful lot of magic to enjoy here. But take a long, hard, scrutinizing look at the components that make up this majestic monolith -- how they fit together, how they work together -- and I daresay there's an even greater sense of wonder to be discovered. 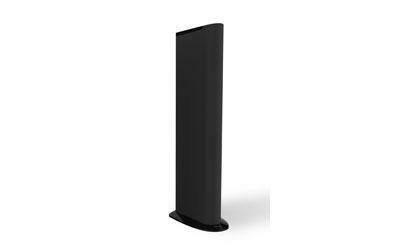 The Triton One, of course, follows three previous tower speakers in the Triton Series lineup: the relatively diminutive Triton Seven, the somewhat larger Triton Three, and the larger-still Triton Two. The Triton One most closely resembles the latter, of course -- so much so that a brief glance at its spec sheets might lead you to believe that the Triton One is merely a scaled-up Triton Two with a larger footprint and more of the same drivers: three 5-by-9-inch Long-Throw Quadratic Subwoofer Bass Drivers instead of two; four 7-by-10-inch Quadratic Planar Infrasonic Radiators instead of two; and a pair of GoldenEar's proprietary 5.25-inch High-Definition Cast-Basket Multi-Vaned Phase Plug Upper-Bass/Mid Drivers in contrast with the Triton Two's 4.5-inch MVPP drivers. If that's as deep as you dig, though, you're missing out on some really cool under-the-hood stuff that makes the Triton One far more than merely a Triton Two on steroids. The crossover network, for example, has been completely revamped, not only in the fact that the crossover frequency has been moved from 160 Hz down to 100 Hz, but also in the fact that it relies on an all-new balanced topology that results in a vastly cleaner signal path. The drivers and baskets sport a new, stiffer design. The amplifier that powers the Triton One's built-in subs has also been redesigned with numerous separate power supplies rather than the single larger supply of past designs, an element borrowed from truly high-end standalone amps. Plus, the DSP has been upgraded from a 48-bit/96-kHz design to 56-bit/192-kHz. I could go on and on. Suffice it to say, virtually every internal component of the GoldenEar Triton One has been tweaked, tinkered with, or outright redesigned from scratch. So, to merely call it a bigger, better, badder version of the speaker that HomeTheaterReview.com called "arguably one of the best loudspeakers under $5,000" would be doing it a serious disservice. Well, there's no denying that it is bigger and badder. When my FedEx delivery guy deposited a pair of Triton Ones on my front porch, the neighbors all sort of gathered and stared, with a collective look that said, "Why on earth does anyone need two new refrigerators?" Each box stands nearly five-and-a-half feet tall and weighs right at 99 pounds. I've had smaller girlfriends. And if you know me, you'll understand what I mean when I say that it's a minor miracle I survived the unboxing process without sustaining any fatal injuries. Freed from their 19 pounds' worth of packaging, the Triton Ones are a little easier to manage, although the socks that cover the speakers from top to bottom do make them a little slippery. As a result, moving the speakers very far is a two-person job. Aside from that, hookup is pretty straightforward for such a sophisticated speaker. Around back and way down low, the Triton One features a pair of binding posts arranged vertically and a little too close together for my tastes, with an LFE input and volume control for the internal 1,600-watt Class D ForceField amplifier. We'll set the LFE input aside for a bit and come back to it later, because I spent the bulk of my time with the Triton One installed in my home office two-channel system, attached to Peachetree Audio's nova220SE integrated amplifier via a pair of Kimber Kable 12TC speaker cables. My primary source was my Maingear gaming and media PC, connected to the nova220SE via USB, with JRiver Media Center 19 (and later 20) handling the software side of things. The only thing even slightly out of the ordinary about the stereo setup process that deserves mention is that it takes a bit of tinkering to find the right setting for the Triton One's subwoofer level knob. Of course, that's true of any two-channel system with a sub thrown into the mix, but it did take me about half an hour of tinkering and testing to zero in on a setting that sounded equally good with N.W.A. and New Grass Revival alike. After a few weeks of auditioning the stereo setup, I also moved the Triton Ones briefly into my main home theater system, where they were connected to my Anthem D2v 3D A/V processor and Statement A5 multichannel amplifier via Straight Wire Encore II speaker cables and a pair of custom-made subwoofer interconnects whose exact pedigree I've honestly forgotten.